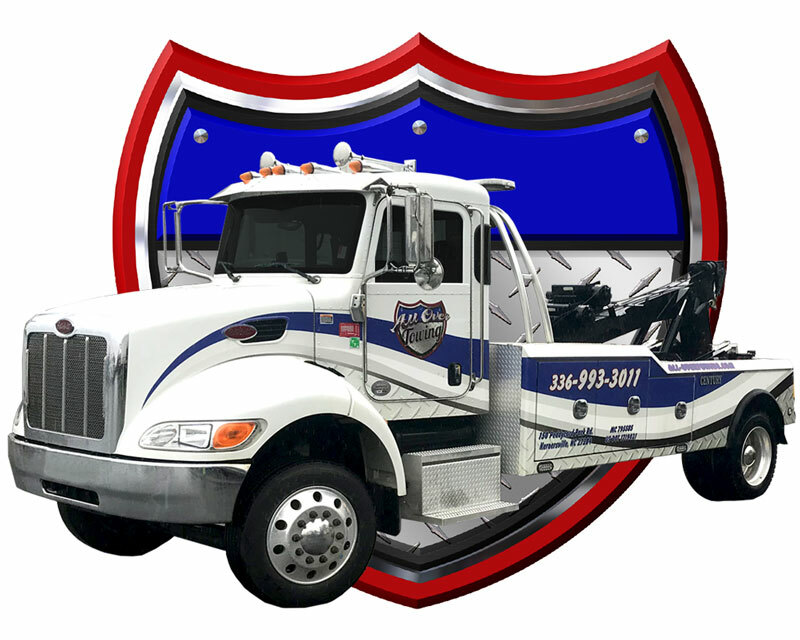 Providing 24 Hour Light, Medium, & Heavy Duty Towing! Serving High Point, Kernersville, Winston Salem, King, Archdale/Trinity, Greensboro, Lewisville/Clemmons, Walnut Cove, & Walkertown! All Over Towing in Kernersville, North Carolina provides quality towing & roadside assistance “all over” Forsyth, Guilford, Stokes, Randolph & Davidson Counties. You can call on us to be there for you day or night, just call our 24/7 Emergency Dispatch Center. Serving the Triad’s towing needs for over 15 years, our team is as experienced as it gets. Each technician is trained on the latest and safest towing and recovery techniques to ensure your vehicles are safe and back on the road in no time. We are a locally owned & operated business that cares about our customers. At the end of the day, nothing feels as good as helping someone out of a jam! Rely on the people who care, at All Over Towing in Kernersville! Need Help? We’re All Over It! Our state-of-the-art dispatch center is ALWAYS OPEN and ALWAYS READY to send one of our professional drivers to your location when your car breaks down, or you have the misfortune of being in an accident. Our wreckers & flatbeds are equipped with the latest technology & equipment to ensure a precision tow each and every time. Our highly skilled technicians are also available for roadside assistance and are always prepared to handle fuel delivery, lockouts, dead batteries, flat tires and more! Just submit a request online, or give us a call, and we’ll be All Over it! Here’s what our customers have to say about All Over Towing! Founded in 2000 with just a few trucks, we’ve worked hard over the past 18 years to grow our towing & roadside assistance service into the modern, state-of-the-art fleet it is today. Our entire fleet is always staffed by professional, courteous, licensed & insured drivers! By ensuring complete customer satisfaction, we’ve been able to build a loyal client base and routinely work with corporations, law enforcement, car dealerships, and motor clubs. In fact, we are AAA Affiliated and are called on often to assist their members on the road. In addition to large organizations and motor clubs, All Over Towing is always available to assist anyone who needs help on the road. 100% Satisfaction Guaranteed! Check out the latest updates and photos from our team! The absolute best in the business!!!! Yes!! This team is the best!! Thank you for helping me out! Back in action in no time! Smith Bill I remember this! !